Music was a huge part in our lives ... it was something we both were connected to. Gary and I, we both loved American new country music so very much and we shared this passion from the beginning. Gary told me about his favorite songs or asked me to send him the lyrics of a certain song and I told him about my favorite songs as well. I sent him hundreds of lyrics and described music videos to him. When Gary heard "Without You" by the Dixie Chicks the first time he asked me to buy me the cd because he loved this song so very much and Gary often dedicated the lyrics to me, explaining that it's not only a song to him, explaining that he truly feel in this way, that without me he's not okay. Sometimes Gary told me about a new song I indeed never heard before and it was quite nice when I have been to Texas, driving around and suddenly I heard a new song on the radio, listened to the lyrics, only to find out that it's a song Gary already mentioned (e.g. "One More Day" by Diamond Rio, "I'm Already There" by Lonestar, "That's Just Jessie" by Kevin Denney or "I Miss My Friend" by Derryl Worley). 2 months after we met, when we began to build a close friendship ... I already read between the lines that Gary liked me a lot ... I felt that he's falling in love with me as I was falling in love with him and it was so sweet when one day he dedicated some love song to me. It was like a first shy advance to me: "Dearest Claudia, I am in paradise right now ... my eyes closed and smelling deeply of your letter which I've read 3 times in the first hour ... and your photos !! There is a Kenny Chesney song that I am singing to you right now ... 'When I close my eyes - you're all I see ...' (oooh I love that song and my voice is perfect on that song.) Do you really think the guards will chase us away if we sing ? ... Gimme the microphone !!" (Gary on August 15, 2000) From this moment on I knew that Gary was in love with me, but that he still was too shy to tell me so. The only song on the cd I never could share with Gary is "No Matter What" by Boyzone. I sent Gary the lyrics because I think the song fit perfectly to our situation and Gary would have loved this song. They played the song 3 times for him on the radio, but unfortunately he never had a chance to listen. The first time they just brought him to the shower before they played the song and the two other times the antenna of the prison was gone and Gary could not listen to anything at all. 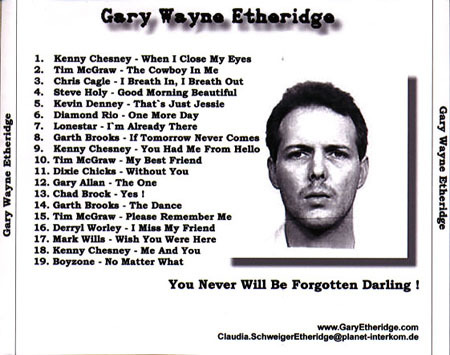 When Gary got an execution date for June 27, 2002 I got the idea to make a cd with our songs ... with all the songs that meant so much to us. The songs we were talking about so often and at the visits Gary even sometimes sang these songs to me. Gary had a very beautiful voice and could sing so very well. Since he loved music so very much Gary often asked me to sing to him as well but I was way too shy. Only one time I sang together with him and Gary was so happy because no one ever sang to him before. I designed a cover with 2 pictures of our visits where you can see the love in Gary's eyes, the love he felt for me. Another picture of Gary was taken in January 1990, a month before the crime happened and I love this photo so very much as well as I love Gary in the pictures of his childhood. What a sweet sweet boy. Inside the box I decided to put Gary's picture from the prison record because he looks wonderful on that picture too and it was the first pic I ever saw from Gary. 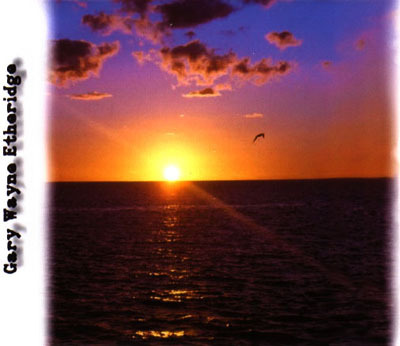 On the opposite side you'll find the picture of a beautiful sunset at a beach. On the back I listed the songs of the cd. Gary signed my copy with the words "I THANK GOD THAT WE HAD THIS TIME. I THANK YOU FOR HEALING ME. 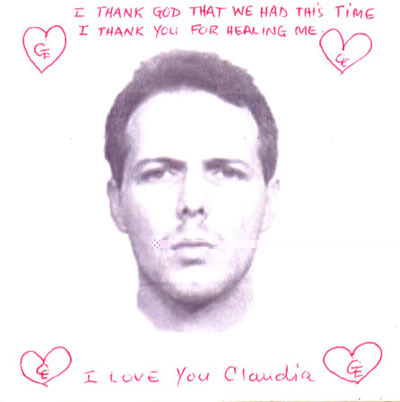 I LOVE YOU CLAUDIA"
When Gary got a stay in June 2002 he was so happy and he sang to me "One more day, one more time, one more sunset maybe I'd be satisfied, but then again, I know what it would do, leave me wishin' still for one more day with you. One more day." 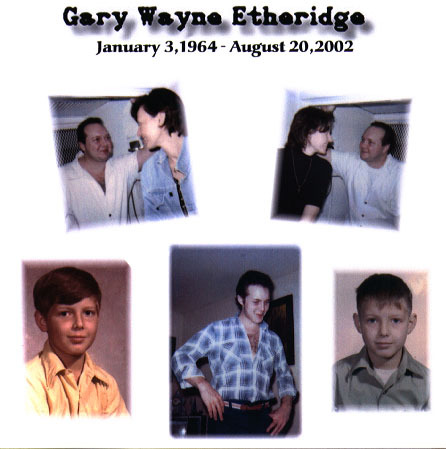 After Gary's execution I sent a copy of the cd to Gary's friends as a memory. After Gary's execution it became difficult for me to listen to our songs again. Today when I listen to the first beautiful and romantic song Gary ever dedicated to me - "When I close my eyes, you're all I see" - today the first words of the song are making me so blue, because these words now became reality: "There's so many things, I didn't say, and even though, it may be too late, I want you to know, I still love you so". Today when I listen to our songs, sometimes I get pretty sad and I cry a lot, but sometimes I begin to smile and remember all the sweet memories. I remember each single word Gary told me about these certain songs. I remember him singing them to me. I remember how moved he was when he told me about a sad country song and I remember that Gary sometimes even cried when he was so moved by a sad song or even by a happy love song. Gary was such a special and sentimental man, there could never be another, to make me feel the way he did. We fell in love all over and I don't know where we'd have been without each other. Life with him made perfect sense because Gary was my best friend. Good mornin' beautiful, how was your night ? Well you had me from "Hello"
But you had me from "Hello"
Until you're sure that I'm "the one"
Chad Brock - Yes ! Oh then I asked her "Can I see you again?" And she said, "Yes !" And I said, "Wow !" And she said, "When ?" And I said, "How about right now ?"